Porridge is notorious for being a healthy breakfast, particularly on cold winter mornings. But are all oats made the same? Oat groats: All oat grains begin as groats, they are simply hulled, toasted oat grains. They are not commonly available except for in some health food shops. Normal cooking time is 20 – 25 minutes, similar to any other wholegrain like buckwheat or barley. If you have the time to find and cook these guys they are the least processed of your oat products but aren’t necessary for a hearty healthy breakfast. Steel cut oats: These have recently made resurgence into the marketplace due to health trends/bloggers. In actual fact, they have been eaten traditionally in Scotland and are known as ‘Scottish oats’. Steel cut oats are produced when the groat is cut up into small, thick pieces. They taste nuttier and have a gritty texture. Cooking time: 15- 20 minutes once added to boiling water. 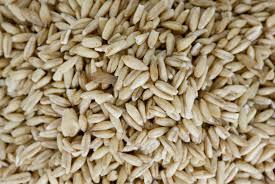 Rolled oats: Instead of being cut into chunks, oat groats are flattened, rolled out and then steamed. This processing makes it cook faster and means they can be cooked in around 5 – 10 minutes once added to boiling water. Quick oats: These are the most heavily advertised and commonly used oats from what I have seen with clients. Quick oats are more processed than rolled oats because they have been cut into smaller pieces, rolled for longer and partially cooked which reduces their cooking time to 1.5 minutes in the microwave. Instant oats/ flavoured: Another step down the processing line we find instant oats. You’ll find they are cut even finer than quick oats, plus are partially cooked and often have skim milk powder, emulsifiers and other preservatives added to help them develop a creamy texture when you cook them. This is where the debate gets a little heated – health nuts often argue that steel cut oats are far superior to rolled oats. However there is actually very little difference between the two types. Prevention did a great comparison between both options, check it out here. As you can see there are a few SLIGHT differences, however nothing that will drastically make a difference to your health. Energy, carbohydrates, fibre, GI are pretty much identical. Due to our fascination with health foods, food companies have brought out steel cut oat ranges now, which are nutritionally wonderful but are more expensive than your regular rolled oats. Eg. 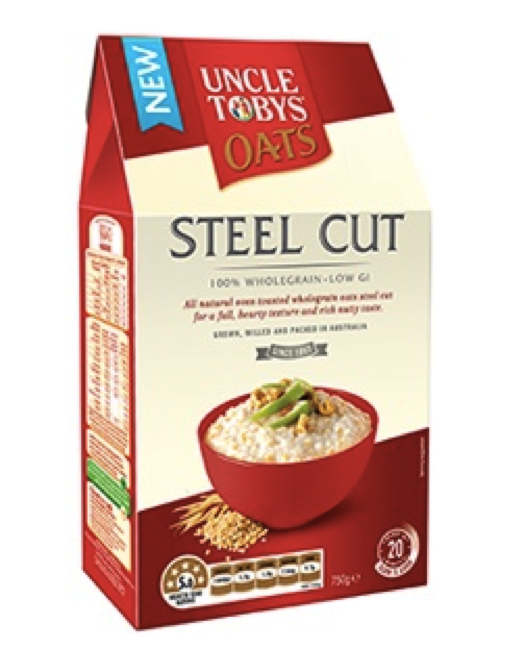 Uncle Toby’s now sell 750g steel cut oats for $5.99, but a 750g homebrand rolled oats is only 0.99c. What this means: faster release of the sugar (from carbohydrates and any added flavours) into your blood stream. Giving you a quick burst of energy in the morning, causing a larger insulin response (not ideal for those with insulin resistance or diabetes) and requires less work for your body to break down. What this means: Due to the level of processing a lot of the fibre that wholegrain oats naturally have are lost. Machines have done the mechanical work that your digestive system was originally designed for. Generally this means they are less filling and chances are you’ll be hungry again an hour or two after breakfast. What this means: Added sugars are a significant energy contributors to the diet and one of the biggest nutritional challenges we face as a population – it is not secret that Australia is consuming more now than ever before. Flavoured sachets have extra sugar added, just look at the ingredients list. Our general rule of thumb is to avoid products that have sugar listed in the top three ingredients. In most quick/instant flavoured oats sugar is the second ingredient, which adds extra sugar you simply don’t need on a daily basis. Plus eating sweet tasting foods as part of your regular diet is only training your taste buds to constantly seek out sweet foods. Choose traditional rolled oats and if time and budget allows then splash out for steel cut oats. Focus on the quality of your food products not simply the energy on the side of the packet. Beware of added sugars, especially in the gourmet packets of oats with added flavouring, dried fruit and other bits and pieces. Do it yourself by picking up good old fashioned rolled oats (like your grandma would have) then add some flavouring turn to your natural, fibre rich fruits and vegetables like bananas, pears, apples, berries and even carrot with a sprinkling of cinnamon, crushed nuts and a little (1 tsp) raw honey or 100% maple syrup. *Prices as per Woolworths online 4/6/2015.